Since 1974, DenMat has been a leader in high-quality dental products for dental professionals around the world. We make and assemble most of our products right here in California. DenMat offers three main product categories: Consumables, Small Equipment, and a one-stop-shop Dental Laboratory. Our consumables include the brands you know and trust: Geristore®, Core Paste®, Tenure®, Ultra-Bond®, Infinity®, Splash®, Precision®, Perfectemp®, and LumiBrite®. Our small equipment includes a broad suite of products, including our new SOL™ soft-tissue diode laser, PeriOptix™ magnification loupes and lights, FLASHlite™ (Magna and 1401) curing lights, and Velscope® Vx—the world’s top choice for oral lesion screening. 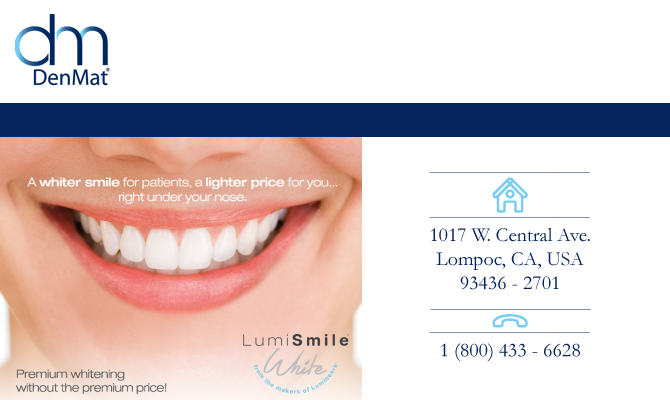 DenMat also is the home of the world’s #1 patient-requested thin veneer, Lumineers®. Now better than ever and backed by Thinnovation®: DenMat’s fresh multi-disciplinary approach to anterior aesthetics using the latest generation of Lumineers. We now craft our Lumineers by using advanced digital scanning, proprietary design software, 3-D printing—all hand-finished by our skilled lab artisans in California. We also feature the ultimate provisional appliances, Snap-On Smile® and Snap-It® partial arch. Each of DenMat’s more than 400 employees is focused on assuring that you—our dental customers—love our products and love your customer experience. We’re building one of the world’s great dental companies—one happy dentist at a time!